I'm unbelievably frustrated that they went back to the old school armor style. The new armor is super cool. Plus this is taking the canon on a really annoyingly wild ride. Yes, I prefer the current armor too. Seeker? Keeping it is something of major importance. Still photographing, currently on Genesis. Having way too much fun playing through with headphones; the attention to detail with sounds is crazy. Halo ce and halo reach to me are the most "halo" art design. Halo is "MILITARY" science fiction. Halo 4 and 5 art style is just science fiction. Too cybertronic, not dirty enough. The original art style is a crossing point between "clean" advanced technology, and the gritty, dirtiness of warfare. So yes, I am very happy with the art style they've chosen and I personally believe that them focusing on the military equipment and the dust and dirt in the trailer, are basically them acknowledging this and correcting it. Which seem to be angles, tall structures, and repetition of design. 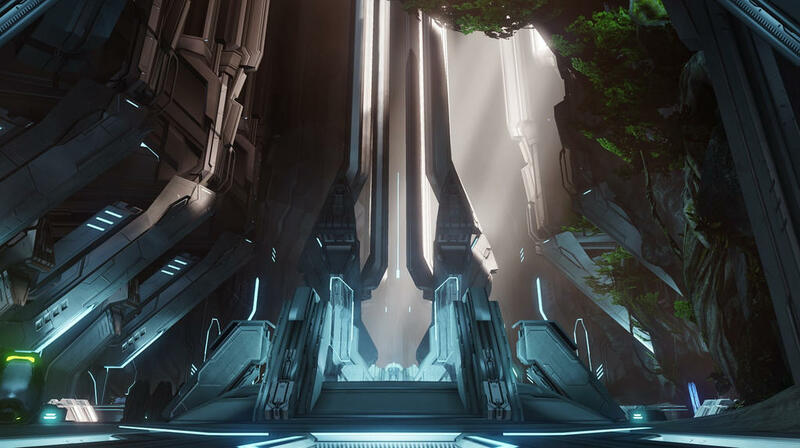 All of which are present in Forerunner architecture in Halo 4 and Halo 5. There is a big difference between them. The original forerunner design was more subtle and clean, looked extremely advanced but at the same time human. Kind of like when the first iphone came out compared to a flip phone. The forerunner look they chose for 4 and 5 is bright orange and looks even more alien than the covenant designs. Most of the technology that we see in Halo: CE, Halo 2, and Halo 3 is not directly war-related. Relay structures, gas mines, cartographers and shield facilities. Much of the designs and terxtures loose the "grittiness" that you reference here by Halo 3, and retain a clean - if not dull - appearance. Any "grittiness" in Halo: CE and Halo 2, I feel, can be attributed to graphics and the aforementioned repetition of texture patterns. Objects that are related to war that we see of the Forerunners - Sentinels and even Monitors - actually do have a more "science fiction" feel to them. Sleek, high-sheen metallic surfaces clean of dirt and grime. Some of the Sentinel designs have the familiar angles and triangular shapes, but other areas have more curves and oblong designs. The Monitor is entirely spherical, and stands out the most from his surroundings even in Halo: CE. The biggest divide that this creates - aesthetically - is the difference between "dead" Forerunner architecture and "living" Forerunner architecture. 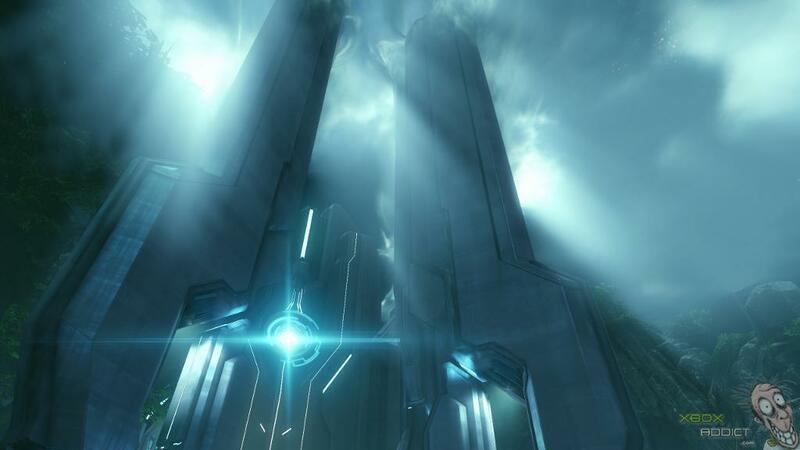 By the time of Halo 4, we are entering a period in the canon where the Forerunners have returned, so it wouldn't make much sense to see a lot of "dead" architecture. Not only this, but in Halo: CE, 2, and 3 we are only ever seeing the works and creations of one rate of Forerunner society; the Builders. Specifically, corrupt Builders who are loyal to the Master Builder, and subsequently tore down the other rates of Forerunners. The constructs that we see - the Halos and the Lesser Ark - were also constructed hastily, in the periods during the Forerunner's war with the Flood. Requiem, on the other hand, was created by Warrior-Servants. It is one of the oldest examples of such architecture, at a time when Warrior-Servants were at the top of Forerunner society, and when the Forerunners were not at war. Requiem has the luxury of being created with time to create. Differing from this, we have Genesis - a Builder world. 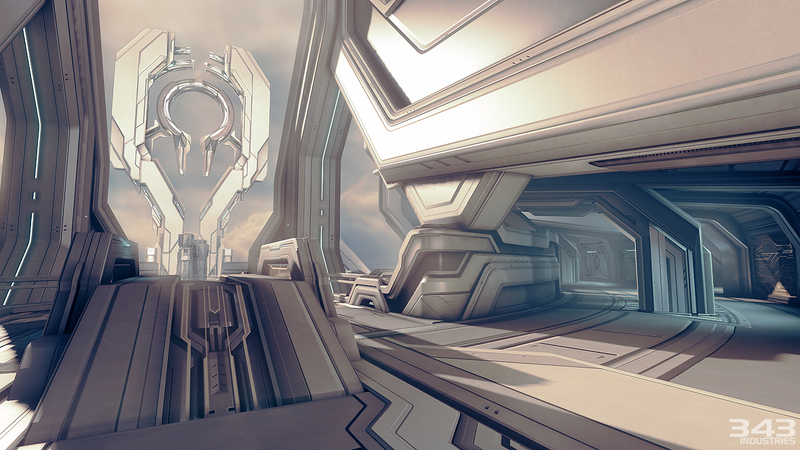 This area is unique from other Builder sites and architecture, and it differs significantly even from the Forerunner architecture (possibly Security or Warrior-Servant) that we see in the beginning levels of Halo 5. You did hit a nail on the head in your second post, and I'll get to that here in a second. I wouldn't take too much from the trailer, as it was primarily a tech demo meant to show off the new Slipspace Engine. At the end of Halo 5 we have their message "See you on Sanghelios", rather than anything about a Halo ring, so I think it's safest to assume nothing based on this demo trailer. Less chance of being angrily disappointed that way. Hold on--didn't you just say that the original design was dirty and gritty? Designs in Halo: CE also have quite a bit of complexity for the limits of the Xbox's graphical capabilities, and we see this exponentially increase in detail and design with Halo 2 and then Halo 3. In contrast, the designs in Halo 4 and 5 are much more "clean". but at the same time human. This is the nail here. The "original Forerunner design" seems to be from a time when it was going to be that Forerunners were humans, and vice versa. This is very much no longer the case. The designs are not bright orange. Many of the lights that we see on Warrior-Servant architecture is orange (blue while in control of Lifeworkers - i.e. the Librarian), and red for constructs belonging exclusively to the Domain and Cortana's Created. The objects themselves, however, are still shades of grey as they have been throughout all Halo games. They are, of course, alien in that they are not human. It appears they’re going back to the classic art style that appeared in Halo Wars 2, but some things look a little too cartoony and like Fortnite for me. I hope this isn’t the case, but this was mainly just showcasing the engine after all. I’m sure they know making things look like Fortnite wouldn’t go over well. How does the trailer look like Fortnite? Whatsoever?Cartoony? Like it looks real af, maybe some parts may have looked a little too much like a Halo Terminal scene in the beginning but even then it still looked beautiful! The forerunners were supposed to be human. this was the build up throughout the series. they screwed it up. The forerunners are humans, this is essential to halos storyline. why do you think everything has biblical references, "the flood, the ark, halo, the prophets"? the forerunners were humans before they activated the rings. the survivors that lived in the ark repopulated and became modern humans. The artifact is literally buried in Africa "the cradle of life". This is the portal to the arc they used to come back to Earth. Its so obvious the forerunners were humans.They lost their technology along the way and had to restart. Their old designs are still human just way more advanced. "Hold on--didn't you just say that the original design was dirty and gritty? Designs in Halo: CE also have quite a bit of complexity for the limits of the Xbox's graphical capabilities, and we see this exponentially increase in detail and design with Halo 2 and then Halo 3. In contrast, the designs in Halo 4 and 5 are much more "clean"." The forerunners were supposed to be human. this was the build up throughout the series. they screwed it up. The forerunners are humans, this is essential to halos storyline. Saying that 343i "screwed it up" doesn't cut the mustard. It was a vague connection at best, and one that had several internal conflicts. Pulling away from the "Humans = Forerunners" and rather going with geas doesn't "screw up" anything that relies on a single line from a rampant Forerunner construct, when no other Forerunner entity - namely Mendicant Bias - recognizes humanity as Forerunner. Also you missed my point entirely and went off on a tangent about forerunner design. I understood your point quite well, but thank you for dismissing something that took a great deal of time as a "tangent". Ah, and in enters the "power ranger" argument; never seen it applied to the Marines. Hard to really see them as "power rangers" when their armor isn't a rainbow coalition like a 70's German disco. The point i was making is that the basic military feel that halo used to have regarding the human race specifically is for the most part gone now. The war is won; why would Humanity not clean up it's appearance? The UNSC is no longer running for their lives and on the brink of extinction; humanity is back on top, and benefiting from many new alliances and discoveries. Their technology will ultimately reflect this. Also, just to keep in mind, 343i was not the first to do away with the "gritty" look of humanity, in favor of a more sleek and "sci-fi" look. If you remember, the Halo Reach epilogue clearly shows a very advanced and "clean" Human ship, and one that's very much in line with both current UNSC designs and even some Forerunner influence. by "clean" you mean plastic looking and over designed. Your opinion. 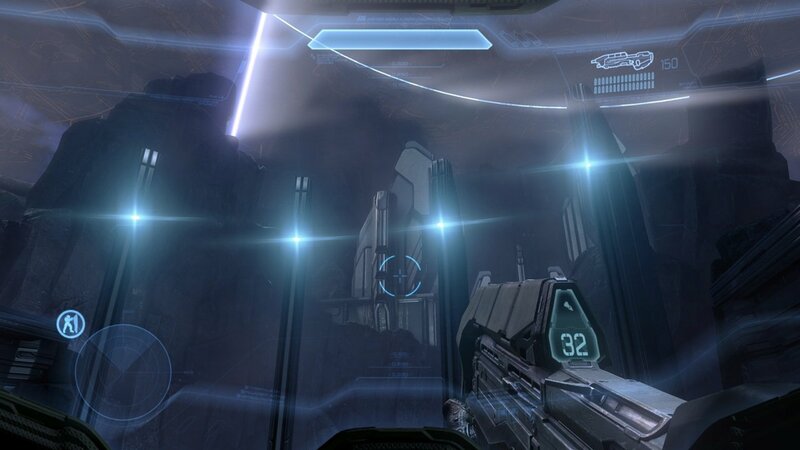 In my opinion, no Halo looks more plastic than Halo 3. In many screenshots that I've got above, I think it's quite well - and factually - shown that Halo 4's Forerunner design (5 coming very soon) is no more "over-designed" than that in Halo 3. 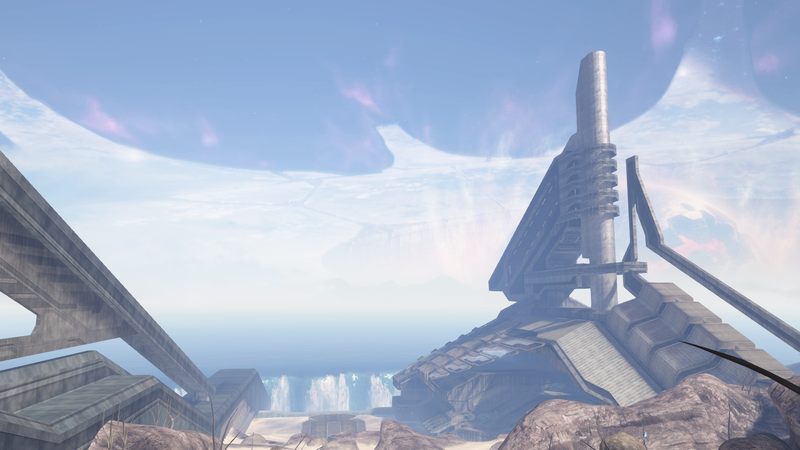 Halo Reach we see exactly one Forerunner ruin, buried underneath a glacier, and hardly see any of it at all. The designs in Halo 4 and 5 are overall simple in design, uniform and symmetrical so as to not be a jumbled mess, definitely sleek (contrasting Halo 2 and even Halo 3), and certainly "high tech". I think it's quite well - and factually - shown that Halo 4's Forerunner design (5 coming very soon) is no more "over-designed" than that in Halo 3. Don't get too excited. That's just your opinion. Whether something is "over-designed" is inherently a subjective matter. By trying hard to refute the statement that 343i's Forerunner style over-designed, you're just missing the point. It doesn't matter what conclusions you draw from the games: other people will look at the same games and draw different conclusions. So, rather than trying to argue that 343i's Forerunner style is not overdesigned, you'd be better off trying to figure out what could make someone think it is. Which is why I pointed out earlier that rather than trying hard to look for similarities between Bungie's and 343i's designs, you should try to look for the differences. If I took your recent efforts in this thread at face value, it seems like I should be inclined to believe that there's no difference whatsoever between Bungie's and 343i's Forerunner designs. Our discussion pretty much went: I name elements Bungie used in their designs, you do your best to find any instance of those elements from 343i's games. That, of course, won't be difficult, because it's not like 343i's design contains nothing from the original (and this has never been the claim). You don't pay attention to the fact that something is different between how 343i designs Forerunners, and how Bungie designed Forerunners, and it's that difference that holds the key to "over-designed". Specifically when it shows the legs of the marines. I've always loved the aesthetic of the Forerunners, both in the classic and the modern day Halo games. I get what a lot of people are arguing, that there's a level of simplicity between Bungie era Forerunner architecture/art style, and that of 343 Industries. Even so, both have their own form of elegance and beauty. The only disconnect with that is with certain aspects of designs, for instance a lot of new Mjolnir armors and some of the Forerunners (the Guardians and some structures.) Is that necessarily a bad thing? Not completely. Sure, some of the Spartan armors look a bit disturbing (let's never forget how bad Seeker is), but you also have a lot of streamlined nice armors like Soldier, Venator, the armors of Osiris and Blue Team, all of the Reach armors including the ones in Halo 5, and even Recruit, which a lot of people favor. I look at the environmental details with the same respect. I think a lot of the Forerunner architecture is beautiful, both the old and the new. Of course, one has to look at this from multiple perspectives, and this is just one simple minority opinion from a player who enjoys both 343 Industries and Bungie equally, against a ton of classic vs. modern fans. I do pay attention to what others feel about both 343 Industries and Bungie though, and I can understand both sides. My only gripe with the current Forerunner architecture is that it's too clean. By clean I mean there's no age to it, no wear, no weathering, ect. In Halo 2 and Halo 3, a lot of the Forerunner structures had a worn feeling, a lot of rust and even some dirt on them, mostly on Delta Halo for the reasons of not having 2401 Penitent Tangent to oversee the restoration of the Installation's environment. While this looked very nice, I'd like to point out that even the Forerunner structures that are clean in Halo 4 and Halo 5 still look nice. The Terminus in the Requiem mission in Halo 4 was beautiful, with the pulsing lights on the black glass flooring, all the geometric patterns following one simple design. You also have the large tower floating in the sky when you walk through the cave at the beginning of that level (one of my favorite artistic moments in all of the franchise) when you get a Warthog. Genesis and Requiem were supposed to be consistently maintained Shield Worlds, and both are two Forerunner structures that were supposed to express the height of the Forerunner's technological might and elegance, all while being a safe haven from the Halo array. I can only wonder what Maethrillian would've looked like inside, if the games gave a visual approach, since it was the capital of the Eucumene. I imagine it would've had all kinds of wildlife, ponds, and other organic aesthetics, contrasted by the Forerunner structure itself. One thing that has always amazed me as an artist myself, was the contrast of Forerunner structures against organic environments, and that is something that has fascinated me with the franchise and in overall with the mystery of the Forerunners. Even if it gives the games a sci-fi feeling as others have stated, it still also feels very organic and that is a hard thing to achieve, even for a sci-fi genre like Halo. Halo still has a gritty, war torn feeling, even if there are some things that Halo 5 didn't do best. I actually wish they never changed the color palette in the Halo 5 beta, because the armors actually looked more like they did in Reach. Still, this doesn't change the gripe I have regarding the Forerunner structures that I strayed away from on a small tangent about the overall beauty of them. What I was saying, is that I think if some of these Forerunner aesthetics still maintained a level of simplicity, or even the same intricacy that people call 'over-designed', but made sure to have some wear, I think they would look overall a lot nicer. As Tsassi made mention of in a previous quote about the overall simplicty of some 343 and Bungie structures, you can still have those, and still get away with a lot of the more intricate designs. 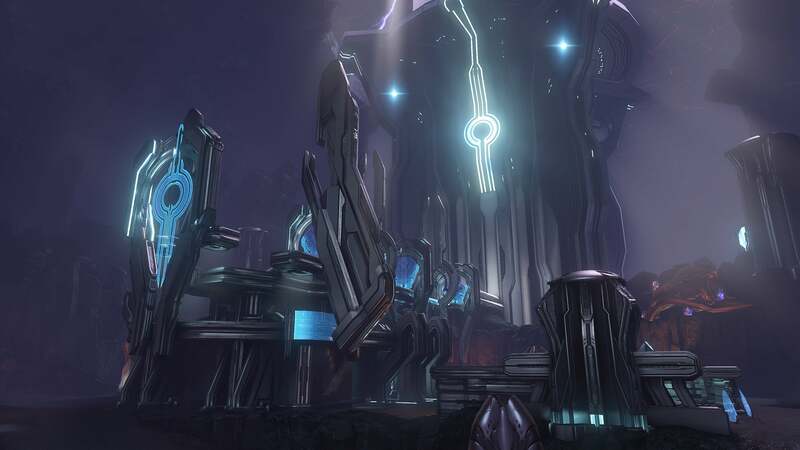 I think adding damaged areas to some of them with red flashing lights like some structures had in classic games when damaged, as well as warped metal and even rust or plasma scarring, you would make those clean Forerunner Structures actually look like they saw a lot more war, like Installation 04 and 05 did. A lot of people seem to think we may be on Zeta Halo/Installation 07, which if that's the case, this is a chance to see some of that kind of aesthetic, since that ring was put through serious trauma and rebuilt a few times over the course of the lore. It also makes sense as to why some structures look a bit sleek compared to previous installation parts, due to that being a older ring with a lot more time put into it's construction, vs. the smaller, more hastily constructed rings of Installation 00. Overall, I just hope we see more 343 Industries aesthetic, but also maintaining a classic feel. I think Halo Wars 2 was capable of finding a middle ground between the two, and even what we have so far saw with Halo Infinite. I hope we see this follow suite for the UNSC as well. I loved a lot of the Halo 4/Halo 5 armors and weaponry. I especially loved the design of the Master Chief in both, because he didn't look as slim as he did in Halo 2 and Halo 3, which gave him more of a super soldier look, like he had in Halo: CE. I also equally loved the old design of Mark VI, and am mutually happy to see it's return. There were a lot of nice armors in Halo 5, as well as a lot of ugly armors, and I hope to see some return and some be replaced with better variants, but add to the customization that Halo: Reach and Halo 4 had, since Halo 5 completely did away with such a amazing amount of customization. To this day, I'll never understand why they did take it away, since everyone really enjoyed customizing their armor and it would've only made clans look cooler in Halo 5 instead of having everyone clad in Achilles/Helioskrill hybrid armors, because there was no way to customize beyond the helmet and body. At the end of the day though, regardless of who is making the games, Halo still feels and looks like Halo to me. Don't get too excited. That's just your opinion. Whether something is "over-designed" is inherently a subjective matter. Regarding being over-designed, yes that's a personal issue. Because the required question will inevitably be "over-designed compared to what?" However with what I've given for Halo 3 and Halo 4, there is a comparison to be made. From what can be seen of Forerunner architecture in both games, while Halo 4's is certainly more active it's no more intricate or detailed in design than Halo 3's. And especially regarding adherence to the overall Forerunner aesthetic, all of the games depictions follow the core design of what makes Forerunner stuff "Forerunner". Even Halo 5. If I took your recent efforts in this thread at face value, it seems like I should be inclined to believe that there's no difference whatsoever between Bungie's and 343i's Forerunner designs. Not at all, in fact I did even state that as it's a new studio, there's bound to be differences in designs. While I've attempted to address "over-design" between the various games (and following chronologically there's a progression of complexity and intricacy that I don't think warrants "over") my effort has also been to show that while there are design differences, 343i's depiction still hold true to the core of "Forerunner Aesthetics". You don't pay attention to the fact that something is different between how 343i designs Forerunners, and how Bungie designed Forerunners, and it's that difference that holds the key to "over-designed". Okay, so what are some of those differences? You mentioned that Halo 4 and 5 have "more going on" in terms of parts (e.g. a Guardian), yet if you compare Halo 3 to Halo: CE, then it's over-designed as there's more going on. So why is 4 and 5 "over-designed" with a line seemingly being drawn at the transition of studios? You also mentioned elements of detail competing, rather than forming a pattern; do you have any comparative examples of this? The biggest difference between Bungie's and 343's forerunner design is that the former one is more grounded. And I mean that in an almost literal sense: All forerunner structures designed by Bungie are connected and attached to the floor in some way, shape or form. I have yet to see any Bungie-designed forerunner architecture that has any floating parts to it. Even though forerunners were absolutely known to have anti-grav technology, they never incorporated it into their buildings. On the other hand, literally the first thing we see of 343's forerunner architecture in Halo 4 is some towers in the distance, held in place above the ground. And the same thing extends to the design of the forerunner machinery. Sentinels and enforcers, while being able to hover themselves, were always one connected object. This does not hold true for most of the 343-invented drones or even weapons: Controller and retriever sentinels, knights, soldiers, and last but not least, Warden Eternal - all have floating parts to them... to the point that for example the knights' legs aren't even connected to the torso. Then why have legs in the first place and not have them fly for air superiority? Same goes for the weapons, the light rifle and scattershot have floating weapon sights, while the binary rifle splits into multiple parts while aiming. In fact, all of the forerunner weapons we see in the reclaimer saga are able to dis- and reassemble themselves. This is a clear break from Bungie's design style, and no matter how many differences you found between CE's and 3's designs, they never broke with this clear mantra. That being said, while I wish 343 would just calm down with most of their designs - the enemies specifically reminding me more of Bay's transformers than anything else - I honestly do think that at least most of the architecture itself looks okay and just had the misfortune to be subject to horrible lighting (and some bad texture work). Earlier forererunner structures had a matte metal design and were only slightly illuminated, with natural lighting still taking precedence. When looking at the control room, it's clearly visible but does not immediately take center stage compared to the ravine it sits in. Both are visible in their own right. 343's buildings on the other hand are either placed in such dark environments that you usually can't even see the surroundings or so highly reflective that it overtakes anything in the immediate vicinity. Add to that the perpetual floodlights with their aggressive lensflare and the buildings are usually the only thing you are noticing, if you're even able to see something while being blinded. If they'd tone down the reflectiveness of their textures, brighten up the environment and get rid of most of the light sources on their buildings, then some of this stuff might actually be seen as genuine forerunner architecture. It probably has to do with how the detail is applied, and not just the amount of it. Not that "amount of detail" is in any way a well defined concept, but even if I agree that the amount of detail in Halo 4 isn't noticeably higher than in Halo 3, that doesn't really change the fact that Halo 4 feels over-designed. It just means that, say, the raw number of lines in a structure isn't the culprit. Okay, so what are some of those differences? Some of the differences I've already discussed. Others are material choices, colors, the use of contrast, the use of light. Maybe I should write a more detailed discussion about Bungie's art and 343i's art with examples, but I really don't have the time to give it the necessary attention. You mentioned that Halo 4 and 5 have "more going on" in terms of parts (e.g. a Guardian), yet if you compare Halo 3 to Halo: CE, then it's over-designed as there's more going on. So why is 4 and 5 "over-designed" with a line seemingly being drawn at the transition of studios? Coincidence? 343i simply has a style some people deem over-designed, Bungie didn't. Just because there's more going on in Halo 3 than CE and we're fine with it doesn't mean we're going to be fine with there being even more going on. You also mentioned elements of detail competing, rather than forming a pattern; do you have any comparative examples of this? Right now, I don't have anything better than what we've discussed before. I would have to find good pictures and a better way of explaining what I see. I may try to get back to this at some point. But the difference in the forerunner buildings was because Faver created the halo rings and Didact created Requiem isn't it? Well, I'm pretty happy about this, because grunts and Jackals are going to look almost cute again. Elites are going to look very cool again not like in all the previous games since reach where they looked like giant muscle mass but now they'll look swift and lethal like in the original trilogy, yet I'm going to miss some things too, personally I loved the beam rifle desing in the new games and I liked the master chief armour too (I like the mark vi too but, just like I missed it on halo 4 and 5 I think I'll miss the mark vii now) I liked the new hunters design they looked more Powerful. That's what I always thought but then we got halo 5. The structures in halo 5 are more similar to requiem than previous games and we weren't on requiem then. If people ask you to go backward to solve something they don't like, that is not "negative feedback", it's called whining. Negative feedback is when people tell you they don't like something. Point. If then they follow up with a contructive criticism, it's another story. Let's agree on the fact that H5's art style can be improved. Is it the right thing to do going backward? Imo the old art style has its flaws too, one above all, it doesn't look realistic. In this day and age a key selling point for a videogame is how realistic it looks. There are very bad games that sell a lot of copies just based on how realistic they look. The Last of Us, Horizon Zero Down and Uncharted for example, they look very good but I couldn't bring myself to finsh them for how bored I was, still people praise and buy those games a lot. If you have problems with the new art style, I think going back to the old art style is not the right solution, There are better ways to solve those problems. Infact, I think going back to the old art style would hurt Halo Infinite's popularity more than keeping the flawed H5's art style would. Stop thinking about the small Halo community, except those few fans of the old art style (Let's say it's 50% of Halo community, it's still a very small number of people), all the rest of people, those who are unfamiliar with Halo, are gonna think "Why this game looks so old?" or "Why this game has such unrealistic graphics?". More importantly, if fans don't like something, it's 343i's responsability to choose how, in which way to change it, if they wanna change it. 343i has a lot of good and competent devs and artists, they are by far more qualified than fans to chose the art style. That's why people should stop oppressing and forcing 343 on what to do, that's why they should be more careful on listening to fans' requests. Let them do their job freely, let them make the game they want to make. If you want a game to be exactly like you want it, then go learn how to make videogames and make one of your own, because that's exactly what the devs at 343i did with their lives: they spent many years of their lives studying and working to have the chance of doing the game they want, not to do the game you want.